The Top Ends leads the way in a drive to crank up economic development in the nation’s north, with Central Australia clearly a late starter. Will The Centre become a well-adjusted, harmonious community that’s celebrating its diversity and making a motza from its social and natural attractions? Or will much of it remain welfare dependent with dire consequences of sickness, crime, poverty and hopelessness? The question is out of the too hard basket: Prime Minster Tony Abbott wants to develop The North and its three states are drawing up wish lists. In the NT Infrastructure Minister Peter Styles has ordered a $1m study of “regional infrastructure supporting economic development across regional and remote parts of the Northern Territory over the next 30 years”. Is Central Australia ready for this? It doesn’t look like it. Here it looks like the cart is being put before the horse. Infrastructure needed by the two scenarios differs greatly: More facilities for police, ambulance staff, nurses, doctors, magistrates, judges and prison officers on the one hand; and on the other, hotels, well serviced parks, entertainment venues, museums and public spaces that are fun to be in. The usual suspects are circling to get their slice of the action: Mining, oil and gas interests; the cattle, transport and shipping industries. But it seems a pitch is still a work in progress – or maybe not even that – for those sectors in The Centre that are pivotal in getting people into jobs and, consequently, out of trouble. That’s exactly what the Central Land Council’s Centrefarm is not doing, using mostly transient labour from interstate on its Ti Tree and Ali Curung plantations. By contrast, the Northern Land Council (NLC) has “has gone into something almost like a partnership with the government, to pursue economic development,” says Mr Styles (pictured). “Take the Tiwis, for instance. The government is looking at communities who want to engage, and these people seriously want to engage. The NLC has handed land over to the Land Development Corporation – some 10,000 hectares, on a 99 year lease – asking the government “to talk to players anywhere in the world, hotels, eco tourism, that sort of stuff,” says Mr Styles. Another Top End example: Treasurer Dave Tollner says a major Australian sandalwood supplier, Tropical Forestry Services (TFS), will develop plantations in Katherine and Douglas Daly, aiming over the next four years to become the largest supplier of sandalwood products in the world. TFS has already invested over $40 million in the Territory, says Mr Tollner. We asked Mr Styles whether there are similar proposals from Central Australia that are feasible, credible and adequately resourced. He said specific development projects may go thorough a whole range of departments but he wasn’t aware of any. An exception is Ben Passmore from Centre Bush Bus who is “is busting his rear end to get people out to places” such as Haasts Bluff and Santa Teresa. As the minister who is instructing consultants GHD – which has a November deadline for the study – Mr Styles seems resigned that the study will be starting from scratch in The Centre – extracting industries excepted, “of which there are a lot near Alice Springs”. He says one mining company would take up the entire freight capacity on the Ghan line, given its current number of passing lanes. Companies will be encouraged to share the costs of upgrading the line, as INPEX is doing with transport infrastructure near Darwin. We asked Mr Styles: Are there indicators of a Tiwi style situation unfolding in Central Australia? If not, why make a study of infrastructure required for developments that may never occur? “I don’t have a crystal ball,” Mr Styles says. He wants locals to “come forward with proposals where we can help generate that. “GHD will be traveling out there. They’ll be talking to people. They’ll generally say, well, what do you need? “We do business a bit differently than even the previous CLP Governments. We’re about sitting down and talking with people, and finding out, what do you want to do? As The Centre is sitting on its hands there is no wonder that development efforts are “top heavy”: Chief Minister Adam Giles and Federal Infrastructure Minister Warren Truss this week announced a $106m road upgrade program. Only one of the six roads is in The Centre. And, no, it’s neither the Tanami Road nor the Mereenie Loop, both with key roles in the tourism industry. Why it is the Santa Teresa road (upgrade and sealing of various sections) is not explained in the release. The others are the Roper Highway, Port Keats Road, Arnhem Link Road, Buntine Highway and Central Arnhem Road. The Alice Springs Town Council is equally unaware of any grand schemes the local captains of industry may be hatching. The council has only just formed an economic development committee. It had its second meeting this week. Chairwoman Liz Martin – herself the CEO of the highly successful National Road Transport Hall of Fame – says “not much” is going on: “It certainly seems we tend to sit back and wait for someone else to do it for us,” she says. Mr Styles says in the Top End “there’s been a shift in the last five years. People don’t necessarily say, give me the land and give me a Toyota and give me money and I’m going to sit down. And he says it’s now well and truly Northern Australia’s turn to get some national attention: “There have been 150 years of development in [the densely populated] parts of Australia, but we are the poor cousins up here. 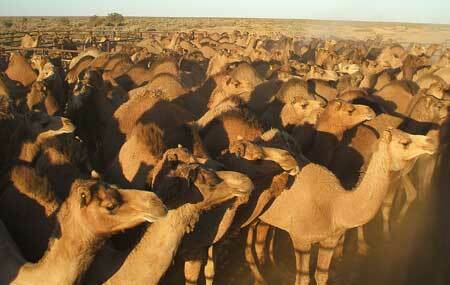 Photos: A million camels are waiting in our deserts to be mustered and sold. No takers so far. An organistion asserting to be Aboriginal, Ninti One, is having them shot from the air, leaving them to rot. A mining rig in Central Australia: Extracting industries seem set to make their case in the $1m regional infrastructure study. The NSW dairy industry plans to expand with cameleer Michelle Phillips acquiring wild camels for milking at her dairy farm near Muswellbrook in the Upper Hunter Valley. The ABC quoted Ms Phillips saying she was optimistic about the future: “I think it would be really nice to tap into this industry, and have something else that we can use as a resource in the Hunter Valley,” she said. All talk and no action. Get stuck into it. Get James Packer and Paul Keating up there and get things moving. ABC First Bite last week featured a camel milk dairy near Perth and claimed a world market of $10 billion for milk. Saudu has a herd of 3000 fed mostly on Australian sourced fodder. Arab interests and buying up dairies in the US to do the same thing. We could do that here as well as contribute to the one million tonnes of meat that China is looking for next year. What was needed to do that was to raise the productivity of our native pasture – particularly the legumes as Qld did years ago so that we can feed lots animals here rather than add value to them interstate. There are so many things that could be done here and they should all have been on public display where the houses are at going at AZRI to attract investment $ and jobs. Dates, quondongs, bush tomatoes. And in particular indigenous medicines and all nurtured by the inmates from the correctional services. Google up Guyra tomatoes or look at the Australian of 11th December to see what would have been possible here. Visitors don’t come here to see housing developments. It is interesting to look also at the report from Professor Sandra Harding, chair of Australian universities at the National Press club teo weeks ago to see just how far away the planning was. She suggested a 30:1 ratio between investment $ and returns over the long term. Governments are blind to all this, and rolled over to self interest. I may be wrong but I believe it took about 18 months from deciding Kambalda (in WA) would be a mine until the first ore was produced. Today, 18 years would be nearer the norm. Any wonder there is little activity. I see Adam Giles is recruiting a couple of very well paid bureaucrats to ‘do something’ about social and economic development. Let’s see what they achieve – I’m trying to suffocate the cynic in me and see this as a good move. Styles: “We do business a bit differently to even previous CLP Governments.” YA DON’T SAY! If you’re serious about development – start with your own team. Development on how to manage staff, development on how to engage with business leaders, development on how to engage with international business / government leaders. Development on leadership and management. You, Mr Styles, and your cabinet are a disgrace and embarrassment to the Northern Territory. But then what do you really care, you never worked for it, you were one of the Giles gang that used the hard working party and opposition MLA members who got you there, then stabbed and stole it. Well. Now you have it. Get off your backside, stop talking and get things done. You are all at the half way mark and the Territory is turning against you in droves! So Central Land Council’s Centrefarm uses mostly transient labour from interstate, and I expect from overseas visitors on holiday working visas, on its Ti Tree and Ali Curung plantations. (Anti-)Ninti One is having camels shot from the air, leaving that walking money to rot in the sand-hills. And the futures of the indigenous Territorians that the Central Land Council is tasked to advance are also being left to rot in the sand-hills. When will those Territorians come to realise that the biggest rock on their road to an integrated tomorrow is the Central Land Council? It has to happen eventually, and then won’t there be a gnashing of teeth and a wringing of hands as payouts are calculated and retirement houses bought!